Growing up in her parents' “show homes,” as she describes them, Julie was inspired early on to help others create their own showplaces. Whether tackling a home or commercial design project, Julie is determined to learn everything she can about the client’s tastes, lifestyle and personality to ensure that the end design is a perfect reflection of the client's dream space. As a co-owner of D3interiors with her sister Lisa, a bachelor's degree in Interior Design and more than 15 years of experience in the industry, Julie's relationships with her clients are her top priority. 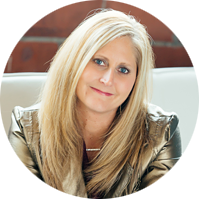 She strives to deliver the highest quality results and the specialized attention each client deserves. Julie passed the National Council for Interior Design Qualification (NCIDQ) exam in October, 2002, has earned numerous awards given by the Nebraska-Iowa ASID chapter and is the 2015 President of the Nebraska-Iowa ASID chapter. In addition to her active involvement in ASID and her busy career, Julie is also the proud mother to three beautiful girls, enjoys spending time with family and friends as well as a proud supporter of numerous charity organizations.